“I am not about to Judge you because the worse has happened.I watched all the videos sent to me and watched you moan and do your thing…No honey it wasn’t photoshop,it was you and one other whilst another lady filmed away. Who released that video?WHY?What did you hope to achieve?Do you know that the people involved can commit suicide?I hear Chidinma is presently hiding for fear of her life. I have been thinking.Were you drugged ‘Nma?How can you boldly look into a camera knowing someone is recording and it could leak? I watched the three videos and my conclusion is this.whoever set out to shame her has succeeded but I leave you to God..She is just a young woman,instead of leading her to the right path,you chose to destroy her.Well done,clap for yourself.Your disgrace will be greater than hers. Please anyone who can reach out to the disgraced queen should do so and counsel her.Kim K is standing strong today after her tape leaked because America shamed the person who leaked those tapes.Please do not shame this young girl.I beg of all those dropping comment cussing her out on other platforms.It smells of a set up.i think she was drugged and set up from the look on her face. No one is perfect, I pray God keeps you safe and i pray your parents also handle this well. I am not judging you Chidinma.sending you E-hugs where ever you are and hope that God turns this disgrace into a life changing platform for you”.. This is my opinion on this issue,i don’t need anyone preaching to me but I REFUSE TO SHAME HER. Have you read it? : History of Beauty Pageants in Nigeria: The Good, Ugly and the Untold Sides. 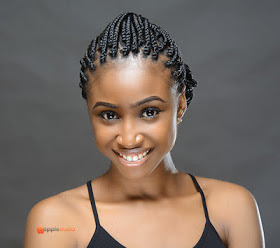 Meet Queen Blessing Utanung Michael ,Miss Christian Ambassador Nigeria 2016. Love her opinion. I know that many platforms that carry the news were doing so just to get traffic.